Stray Scribbles - "Emiko -first chibi, on Flickr"
It has been a while coming, but I’ve finally decided to get a flickr account to host my pictures. My brother has suggested this for a while, but I’ve held on to the weak freewebs account I’ve been using all this time simply because all my pictures are on it, and I’d like to keep my work all together. The problem is that I have a lot of pictures on my freewebs account that I just can’t be bothered moving, so I just kept freewebs, despite the fact that it wont work properly in Opera, and is really slow, etc. 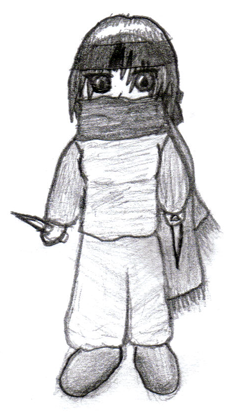 And yes, those are knives she’s holding. Right, right. sif guys can’t have girly hair. Its all over anime and whatnot. When using wordpress, you need to make sure you include the “http://” on your links. Your flickr link in the post is broken. What? The link works fine for me..
Yeah you wish Llama. This chick’s gonna bust you up.